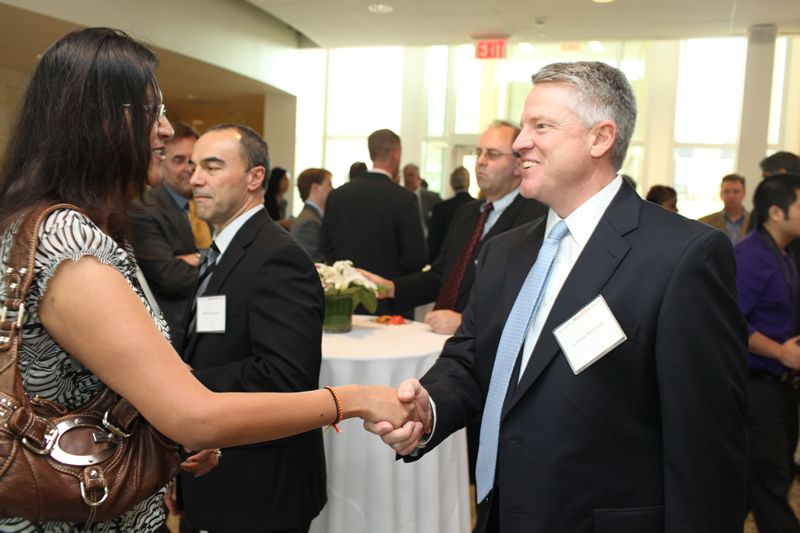 A reception before the panel discussion allowed students and alumni to meet with the speakers, including R. Bruce Northcutt of Copano Energy. With the recent boom in natural gas shale making headlines and grabbing the attention of the country, the big questions seem to be — what are we going to do with all that natural gas and where is it going to go? A special panel of corporate experts leading the charge in natural gas offered their perspectives at the Feb. 22 Distinguished Leaders Series, presented by Sequent Energy Management and held in Michael J. Cemo Hall. The panel included Richard Stoneburner of Petrohawk Energy Corporation, Bruce Northcutt of Copano Energy LLC, Davis Thames of Cheniere Marketing LLC and Dat Tran of AGL Resources. According to reports from the U.S. Department of Energy, at current consumption rates, there is enough natural gas to supply the nation for the next hundred years. 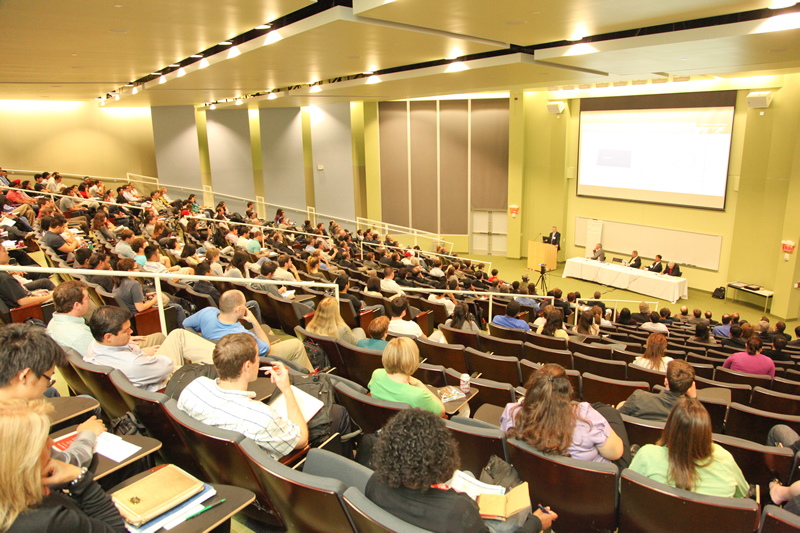 For the first time, the Distinguished Leaders Series was held in Stubblefield Auditorium in Michael J. Cemo Hall, which UH Bauer dedicated in December. Natural gas production has been enormously beneficial to the energy industry, especially in Texas, where the Barnett Shale and the Eagle Ford Shale has been a great economic success. Northcutt’s company, Copano Energy, has seen tremendous growth due to shale gas production. Shale gas has also been discovered in other parts of the country, including Oklahoma, Louisiana and Wyoming. Other countries, including Canada and Australia, have also discovered gas shales, but according to Thames, the United States market offers unique investing opportunities not found anywhere else. And according to Tran, shale gas has dramatically impacted pricing over the last few years, greatly decreasing prices from production all the way down to the consumer. “Consumers have greatly benefited from the additional shale gas production in the form of lower natural gas prices domestically,” he said. Overall, the tone of each of the speakers was optimistic and there was a sense of excitement when talking about the future of natural gas. From the producers, to the transporters, to the consumers — every representative said that natural gas shale production will not only benefit Houston, but the entire U.S. economy. 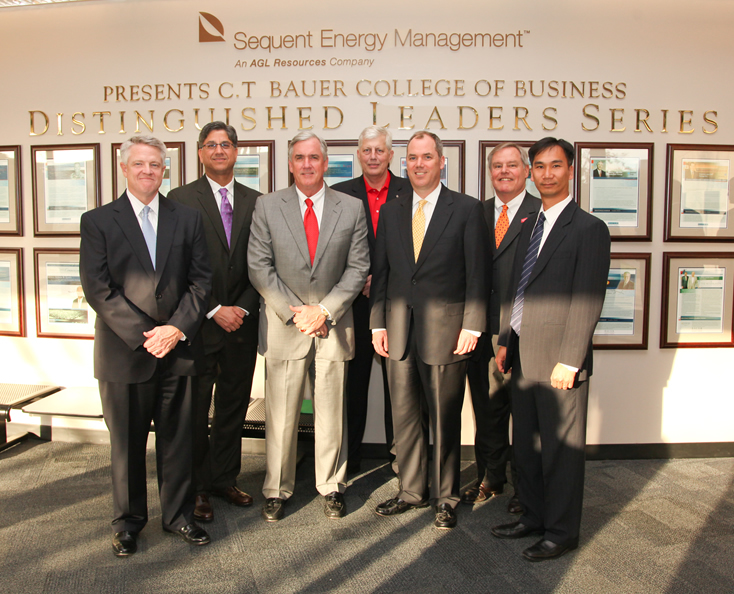 Sequent Energy Management President Peter Tumminello, second from left, was on hand along with UH Bauer Associate Dean Bob Casey, second from right, to welcome the panel, which included Copano Energy President & CEO R. Bruce Northcutt, Petrohawk Energy President & CEO Richard K. Stoneburner, moderator Joseph Pratt, Cheniere Marketing President H. Davis Thames, and AGL Resources Associate General Counsel Dat Tran. 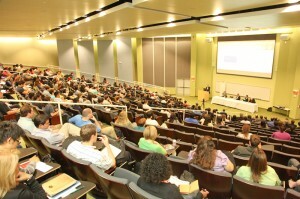 The University of Houston C. T. Bauer College of Business regularly hosts the Distinguished Leaders Series to bring real-world perspectives to its students. In recent years, the program has been presented by Sequent Energy Management, with a focus on hosting energy industry leaders on campus. “It’s good to know that the UH system is developing these types of forums where we can talk about our opportunities and try to bridge the gap in areas where there’s things we can do better as an industry and things we haven’t talked about before,” Northcutt said. Another DLS event will be held on March 24, featuring CenterPoint Energy President and CEO David McClanahan (MBA ’76). For more information or to RSVP, click here.